As the world moves on, files get bigger. From high-megapixel compact cameras to the latest Sony α Digital SLR with its 5 frames per second continuous shooting capability, the pressure is on for flash memory. High Definition camcorders are tightening the screw even further, so Sony Recording Media & Energy (RME) has created a solution in the form of the Memory Stick PRO-HG Duo™ HX. Users need high capacity, and they need high speed data transfer, which is where the new Memory Stick PRO-HG Duo HX comes into its own. With a choice of 4GB and 8GB capacity and a read speed of 20MB/second (15MB/second write)1, it is more than capable of coping with the strain. In fact used with the supplied USB adaptor for maximum speed, it can shorten data transfer time by one-third compared to a Memory Stick PRO Duo (Mark 2). The provision of a USB adaptor as a standard accessory makes it very simple to transfer data onto a PC or notebook, and of course means that there’s no need to purchase one as an extra. Another extremely useful bonus comes in the form of the free, downloadable Memory Stick Data Rescue Service which can quickly recover deleted photographs and files. The Memory Stick PRO-HG Duo HX uses an 8-bit parallel interface to achieve this level of performance, and with its 10 year warranty, represents excellent value for customers who demand the best. 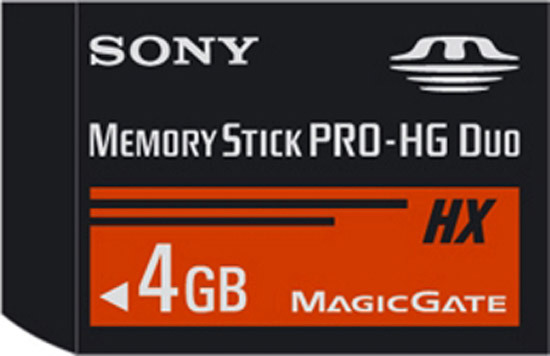 Memory Stick PRO-HG Duo HX flash memory cards are precision engineered by Sony Recording Media & Energy (RME) to provide ever-more capacity for photos, video, music and games. They will be available from Oct. 2008. 1 This speed is based on tests with optimized host compliant devices. Actual data transfer speed is dependent on host hardware. Memory Stick PRO-HG Duo HX achieves 20MB/s in reading mode, 15MB/s in writing mode in combination with supplied USB adaptor MSAC-UAH1.